When someone breaks into your house, it is a very frightening experience. It’s frightening even if you were away when the break-in occurred. You will feel like your entire sense of security has been shattered. You will feel violated. And these feelings are even worse should the break-in occur when you are at home. You will feel as though your very life was at risk. There are statistics out there concerning burglary rates in the United States and they are not pretty. We could throw all sorts of statistics at you. For example, a burglary takes place in the United States every 16 minutes. That means a lot of houses are getting broken into. Many of these break-ins can be avoided if people didn’t make so many mistakes when it comes to home security. 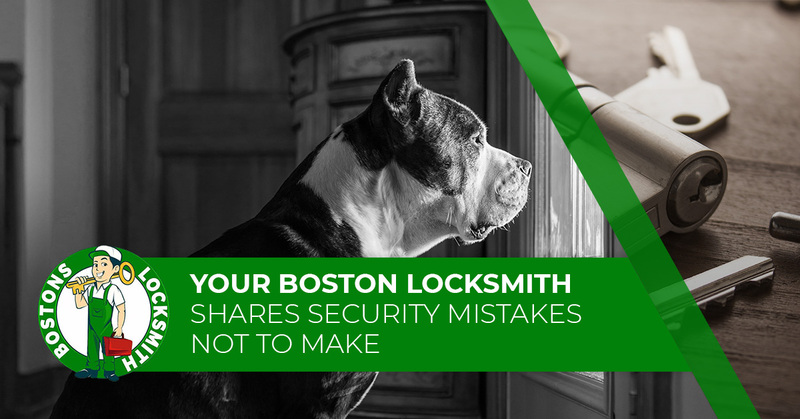 Bostons Locksmith offers you these common security mistakes that it is best to avoid. We are sure you are all too happy to announce to everybody the awesome place you are going on vacation this year. But it is a big mistake when you make such announcements on Facebook and Twitter. You might as well tell the world to come and rob your home as you will be away if you post to social media. Think about it; you are telling people on a public platform where you are going and when you will be gone. It is practically an invitation to have someone break into your home. It is best to wait until you get back from vacation before telling everybody where you went and post pictures. If there were a thief standing in front of your front window, what would they see? If you have valuables, like your Rolex watch or expensive necklace, set on a table in front of the window, it will definitely tempt a burglar who might be scoping out your home. Show a little discretion and keep your valuable items away from prying eyes by storing them in safe places where they can’t be seen. If you have a big dog that barks a lot when they see somebody approaching the house, it’s a good way to keep you aware of what is going on. However, don’t put your faith in the dog when it comes to home security. As mean and intimidating as you think your dog is, there are burglars out there who know just how to deal with a dog. You just never know if Fido would betray you for some sweet talk and a treat. So it is best if you have other security systems in use in case Fido rolls over on you. While those fake security cameras you installed outside your home fooled your mom and one of your neighbors, many thieves will easily catch on to your shenanigans. Look, if you are going through all that effort to try to fool burglars, you may as well just get the real deal and at least have some peace of mind. Especially since there are cameras out there that fit all types of budgets and even have cool features like the ability to be accessed by your cell phone and other devices. You are a fool to hide your house key in the bottom of the birdhouse or in one of those fake rocks. We can almost guarantee any burglar with any sort of intelligence will find where you hide your key. Think about where you would look if you wanted to find a hidden key. You would check every rock in the yard to find the fake one. Then you would check the birdhouse. Do people really do this? Even the little kid living across the street is smart enough to check under the doormat first. It is also a good idea to change your locks out from time to time, especially if you have handed keys out to family, neighbors and what not. You just never know when one may have landed in somebody else’s hands. If you are interested in added security for your home or business, contact Bostons Locksmith.